3 lives, extend at every 300k, Medium difficulty; external autofire is allowed. DETAILS is for which console or emulator, which region release, etc. 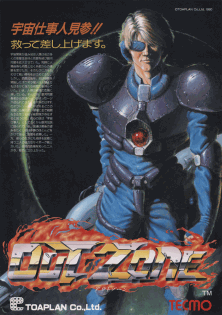 Like other Toaplan games, Out Zone has a region toggle; unlike other Toaplan games, it doesn't seem to change anything. There is a "prototype" version and there isn't much reason to play it. Signs include incorrect music order, missing bonuses, and no intro. Note which romset you used! The new set 1 established in MAME 0.104u5 is weird (bullets and slowdown everywhere right from the start), while the new set 2 should be the old set 1 and makes much more sense. I seem to remember that new set 1 being a then-new dump; either way, it was determined to be a "newer version of the game" and made parent regardless of everything (in other words, it's most likely a bootleg), because that's just how MAME does this. The PCB itself should generally be the old set 1/new set 2, of course. It was even mentioned in the MAME notes that most PCBs tested were this version. Update: v0.149u1 has changed everything yet again. The new set 1 became a clone (now labeled "harder"), and an old clone became the parent. What is now Out Zone set 1 was previously Out Zone set 4 back until before v0.104u5, where it was Out Zone set 3; apparently there was a set 4 before even that, which is either a typo or a version I know nothing about. PLEASE PLEASE PLEASE mention exactly what emulator and romset you used. Last edited by Despatche on Thu Apr 18, 2019 11:40 pm, edited 62 times in total. Will post a score soon. Fixed. I was thinking about what to put there and I guess that I never figured something out. CHI came to Brighton for a visit. Had a blast! I'm going to assume that was 1-6... the scores tell me this is a good guess. 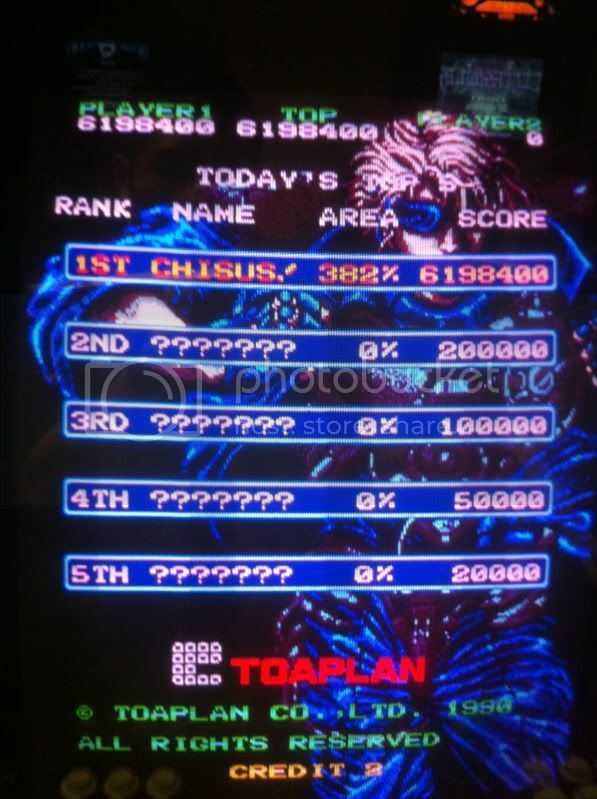 Most of these "vertical run 'n guns" are considered shmups, always have been from what I know. It's a weak start, but it's a start. Soon my OutZone PCB will be installed in Casino Arcade in London, so we should get a few new scores on this thread from us UK lot. Thanks for the update! I just spotted, I went with 'NO' for autofire (following the formatting guide) and I've just noticed everyone has it down as 'ON' or 'OFF'. Mine needs changing to 'OFF' I'm afraid. Thanks! You guys that are getting Autofire off of the PCB - how are you doing that? My stick's autofire circuit doesn't work with my PCB. EDIT: Without me asking, DaveK answered my question here. I'm coming for you CHI! (If I'd have known I was that close I wouldn't have played so risky in stage six!). My first time meeting the stage five boss too, and I nailed him! Despatche; would you consider adding a two-player table to this thread? I know it doesn't do combined scoring on the board, but it works very well as a two player game (mainly because you can't pass through each other's characters so you have to work together) and my OutZone PCB is getting installed in Casino arcade in London this week. The regulars there (me, CHI, hzt, JDE, Dan76, Illyrian, MX7 etc) were planning on focusing on a bit of two player action, and it would be great to have a table to enter those scores in. And any individual team 'make-up' could enter (So if CHI entered a score with hzt as a team, for example, CHI could also be on the table with JDE as a different team). If we wanted to have fun we could even submit with a team name! EDIT: A new high-score (one player of course!) from me. I'm afraid my phone's camera is playing up, so no pic right now. The board is finally in at Casino! I'm coming for you CHI! That's some amazing use of the scoreboard there CHI, well done too! 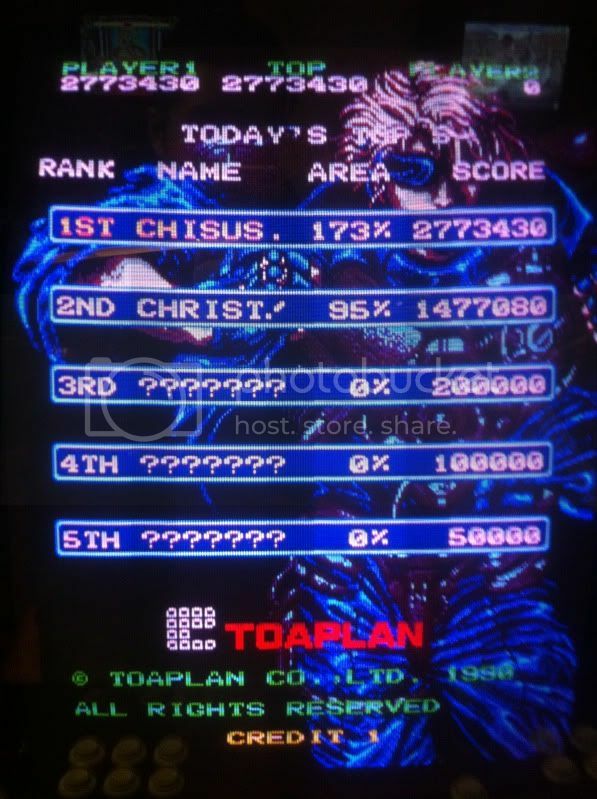 And thanks for putting up the team score CHIsus Christ! I'll dig out the one I did with MX7. When are the others going to submit their scores? And we will get a 2P 1-ALL. Tonight maybe? 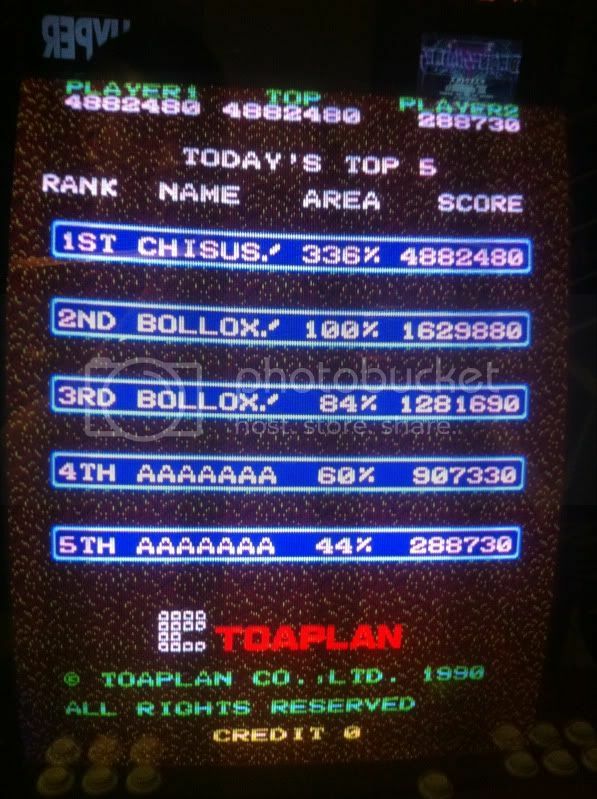 No, you're so close to beating the top score! 7 mil ftw! Had an appointment so had to suicide my last life and literary run away from my cabinet. 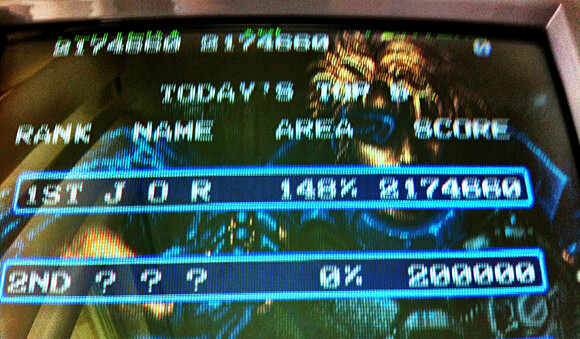 tempted to swap out stage number for the more accurate area %, but i'm not sure about area % counterstopping. either way, i'd like everyone to try including the area % (in case the screenshots vanish) and stage number in future submissions. thanks! Great idea, I always thought keeping track of stages was confusing for this thread. So 289% for me then. Are there any regional differences with this game? Nor really, but the different romsets differ by quite a bit. 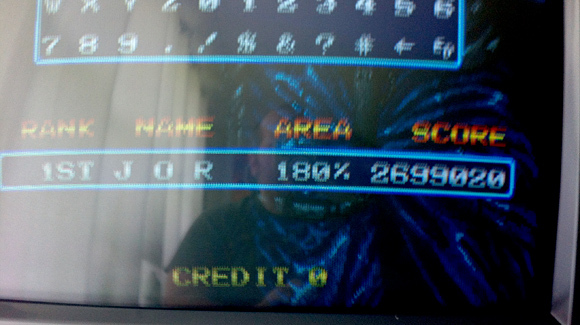 My PCB ia SET2 in MAME, the SET1 one is way harder, at least in loop 1. 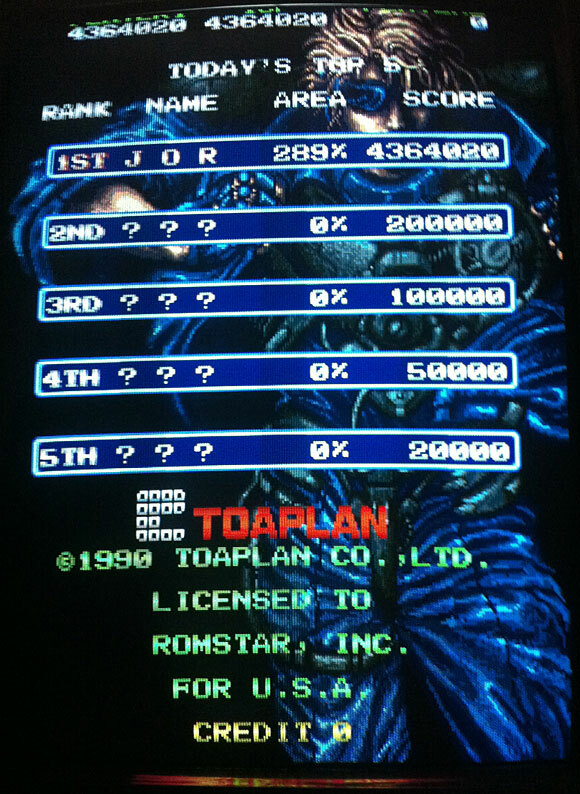 You can set each rom set to display every region with soldered jumpers on the PCB or in MAME's dip settings IIRC.